Gametext: Target opponent must pay for this card As a -, target opponent may Destroy this card and gain (4). What if you could throw a wall up between your Gladiator and it’s attacker? That’s what this card does! It also makes your opponent pay for it! As a response, you can throw this card out and make a target opponent pay for it. This means that they will pay the 3 Resources from their own… and if they don’t have enough, you can’t play this card. They can, as a negative action, get rid of the wall and get their Resources back (with a little extra as a thank you). 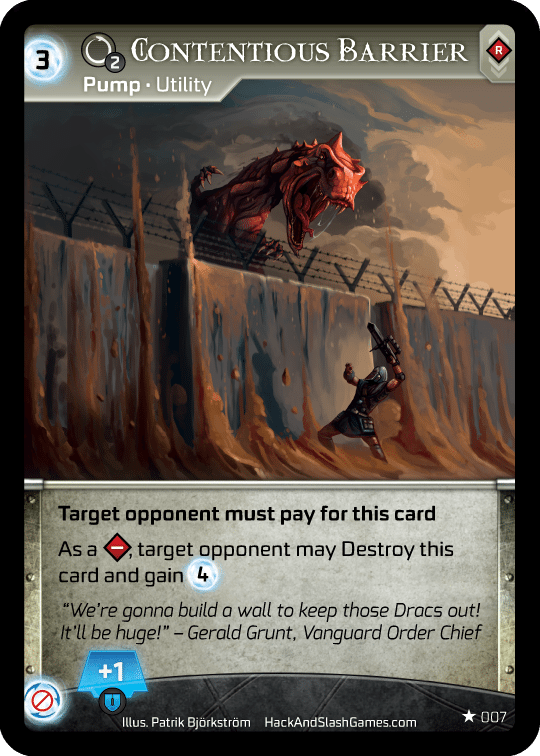 If you are able to play the card, it gives you some shielding to reduce their attack(s) and if they decide that they just want to get rid of the wall, they have to pass the Momentum back to you before they can continue their onslaught. This card is a useful way to stall your opponent and throw a wrench into their plans. You have to be careful, if they spend all of their Resources and don’t have enough for this card, you won’t be able to play it! This card is an excellent foil to cards like Pol-tec Bladebot or any other Character that Attacks for 1. It isn’t an automatic play, but if it’ll keep your Character alive, it’s usually worth playing. How about you? What do you think? Comment on our BGG Page or on our Facebook page!